ROCHESTER, N.H. (CNS) — Close to 1,000 of slain journalist James Foley’s closest friends and family gathered at Our Lady of the Holy Rosary Church in Rochester Oct. 19 for a memorial Mass to celebrate the life of the man who was killed by Syrian extremists on Aug. 19, but whose legacy lives on. Foley was captured in northwest Syria, along with British journalist John Cantlie, in November 2012 by Shabiha militia, a group loyal to Syrian President Bashar Assad. For two years, the family prayed for his safe return. On Aug. 19, the Islamic State extremist group uploaded a video to YouTube entitled “A Message to America.” In it, Foley was decapitated, and the killers threatened to execute more journalists — a threat that was fulfilled when journalist Steven Sotloff was murdered only two weeks later. Cantlie remains a prisoner. Placed just inside the front doors of the Rochester church Oct. 19 was a memory wall — a display of some of Foley’s photographs through the years, as well as mementos of his life, including the manuscript of a novel he was writing. 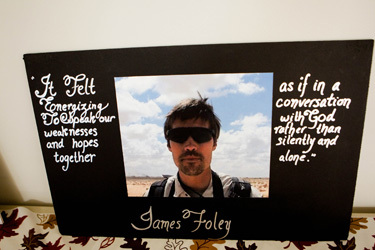 Many of Foley’s friends and family stood before the memory wall and shared memories of trips taken, of laughs shared, of moments now treasured. Quietly, they filed into the church as Foley’s parents, John and Diane, sat with their four children in the front pew of the packed church to celebrate the life of a son and brother. 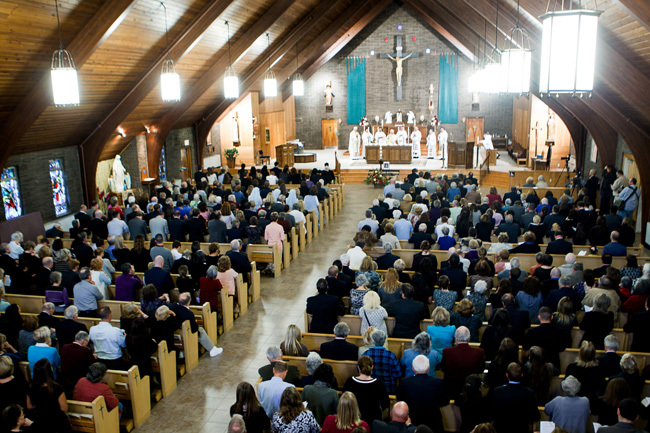 In a homily marked with examples in which Foley lived out the beatitudes, Father Marc Montminy, pastor of St. Michael Parish in Exeter and close family friend, noted that Foley, who started out as an educator, working among impoverished communities through the Teach for America program, turned to journalism as a way to tell the stories of people in need. “It was people’s stories — stories of mechanics, of oil workers, mother and fathers. People living in the extremes,” he said, that were the driving force behind Foley’s mission. Everything changed, Father Montminy continued, when in 2011 Foley and three other journalists — Clare Gillis, Anton Hammerl and Manu Brabo — were attacked in Libya by pro-Gadhafi forces. Helpless, Foley watched as his friend Hammerl was killed. The other three were captured and held as prisoners for 44 days. After being released in May 2011, Foley returned to his home in Rochester, but seven months later began a series of trips to northern Syria as a freelance journalist working for GlobalPost, Father Montminy recounted. He said Foley was always sustained “by a deep faith” throughout his ordeals. Father Montminy praised the Foley family, noting that their suffering never turned into despair. “He walked a dark journey at times. Perhaps even a dark night of the soul at the end. But when he stood before those who would take his life, he stood in hope. He stood in strength, with dignity,” continued Father Montminy. “Happy Birthday, James,” he concluded. As the oldest of the five siblings, James Foley was always teaching them, “whether or not we were willing to learn,” Michael said. Tracy is a correspondent for The Pilot, newspaper of the Boston Archdiocese.